I’ve been getting my eyebrows done for several years now and let me tell ya’ I’ve had more than my fair share of horror stories. We’re not just talking uneven eyebrow situations folks. Unfortunately my naturally thick brows have rendered me a frequent victim of wax happy brow artists. Y’all know what I’m talking about. You walk in with bushy untamable brows expecting to strut out looking like a perfectly arched goddess. Before they get started you say, “Can you leave them thick?” or “Can you just shape them up?” But what happens? Half of your eyebrow gets guillotined and you’re left with brows that belong in a silent film from the 1920’s. A moment of silence for our fallen follicles. But all is not lost! Ladies and gentlemen I bring you a gleaming ray of hope and its name is Browology. Browology Studio is a full-service beauty studio specializing in skin care and hair removal. This studio offers an extensive selection of services including brow shaping, microblading, body waxing, airbrush tanning, lash lifts, and facial and skin care treatments. The brow artists here are all about helping you find the best brow look for you. Browology not only celebrates natural full brows but brow health. How refreshing is that? This luxury studio in Del Mar officially opened in September 2017 and is owned by master brow artist Stephanie Bostwick. Stephanie brings more than 15 years of experience to the beauty industry and was trained under top industry pioneer and beauty influencer Anastasia Soare, founder and CEO of Anastasia Beverly Hills. Yes, THE Anastasia. I had an opportunity to stop by for a visit and had the pleasure of having my eyebrows done by Stephanie. All I have to say is Stephanie where have you been all my life!? I may have to break up with my local brow studio. It’s not you… It’s me. And my eyebrows. When I walked into Browology I was immediately impressed. The decor is in a word… luxurious. The studio is bright, open and airy. Sunlight reaches through large windows and spills onto lovely hardwood floors. The ceilings are adorned with ornate light fixtures that ooze opulence. The garden wall in the hallway is absolutely breathtaking and contributes to the relaxing spa like atmosphere. But the atmosphere isn’t overly spa like. The design choices create a modern but warm vibe and you can’t help but feel right at home. Straight away I was greeted with a smile and a warm welcome from Amie at the front desk. I was offered my choice of regular or sparkling water (fabulous) and taken on a tour of the studio. During my visit I noticed that the music was not your standard “spa music”. You know the type… complete with babbling brooks and obscure instrumentals. Nah, not here. The music is chill, head bumpin’ music that I would actually listen to. As I toured the studio I couldn’t help but notice the simple but elegant Browology logo sprinkled here and there. We need to talk about this logo because seriously… it’s a work of art in itself. Did you notice that the side of the b is a pair of tweezers? Beyond cute. You’ll find it everywhere from the front desk to the pillows in the waiting area to the frosted glass doors. I can’t begin to say how much I adore those frosted glass doors. The entire studio feels like a giant dose of “treat yo’ self.” It’s posh yet inviting. Plus they have Coco chillin’ in the hall and who wouldn’t love this little bundle of cuteness? Alright. Now that I’ve drooled over how gorgeous this place is, let’s talk brows. We hold these truths to be self-evident, that not all brows are created equal! I know, you’re probably thinking I’m crazy… which I am… But hear me out anyway. We all have unique face shapes and facial features right? There’s no one in the world that looks exactly like you, you’re custom-made honey! So if you’re custom-made, shouldn’t you have a custom brow job to match your phenomenal features? Most brow studios simply spread the wax in between the brows, under the brows and above the brows and they often remove all the hair in one fell swoop. They do the same thing for every client. I have dubbed this, the “Cookie Cutter Method.” You won’t find any of that at Browology. Under Anastasia Soare’s tutelage, Stephanie mastered the “Golden Ratio,” brow technique, derived from world-renowned artist Leonardo Da Vinci’s “Golden Ratio,” method to illustrate symmetrical body proportions. Each esthetician on the Browology team is trained in this technique of brow shaping to balance facial features and enhance natural beauty. Translation – You’re going to get a custom brow shaping that is going to compliment your face shape. Let the people say amen! Before transforming my brows from beastly to beautiful, Stephanie drew marks around my brow area with a brow pencil that basically showed me what she was going to do. Think eyebrow blueprint. She explained her process in detail, discussed the different parts of the eyebrow and pointed out the most suitable place for the arch. I felt that this mini consultation made the experience even more personable. In my opinion, this aids in establishing trust with clients and adds an air of comfort. I felt that she truly cared and wanted to do what was best for my facial features. Now on to the wax! I’ve been getting eyebrow waxes for about 10 years now and I still cry. Granted I’ve managed to transition from noiseless weeping to balancing a tear or two in the corner of my eye but the point is, I always feel the pain. That is, until Browology. Stephanie used a cream wax for sensitive skin and I was blown away. I barely felt it. Not. One. Tear. We literally had a full on discussion about characters we hate on Game of Thrones and how gut wrenching Glenn’s death was on The Walking Dead. I felt so comfortable I kind of forgot she was doing my eyebrows. Instead of waxing the underside of my eyebrow in one go, she waxed it little by little. She refrained from waxing the top of my brows and instead meticulously tweezed and cleaned so as to keep my natural shape. As if that wasn’t fabulous enough, she filled in my eyebrows with a brow pencil and popped a little highlighter on my brow bone. I had planned a night of Netflix and Papa John’s but after I saw the results, I felt like I just had to go somewhere because I was feeling like the epitome of fleekiness. I’ve never had my eyebrows done in this manner and now that I have, I never want to go back to the old way. My eyebrows flattered my face in a way I never thought was possible. It doesn’t get any better than that folks. 1. Let ‘em go | Put your tweezers away and let your brows grow to their full potential. This means no tweezing for at least 6-8 weeks! 2. Let ‘em grow | If you have spaces or holes in your brows from over tweezing, use a brow growth serum that conditions, nourishes and strengthens the hair follicles. 3. Throw some shade | Find a pencil that flatters your brow color to outline the top and bottom of your brow shape. Don’t be afraid to draw a little outside of the lines to fake that fullness. 4. Add dimension | Use a brow powder to finish off the look. Powders tend to appear softer, and filling in with different shades adds dimension to the brow. Use a lighter shade in the front of your brow and gradually fill in darker throughout the arch and tail to mimic the brows we were born with (check out your baby pictures!) Use an angled brush and a spoolie to blend to perfection. 5. Finish and let ‘em glow! Always finish the look with a gel to set your brows, as well as a highlighter on your brow bone to brighten and lift your brows. 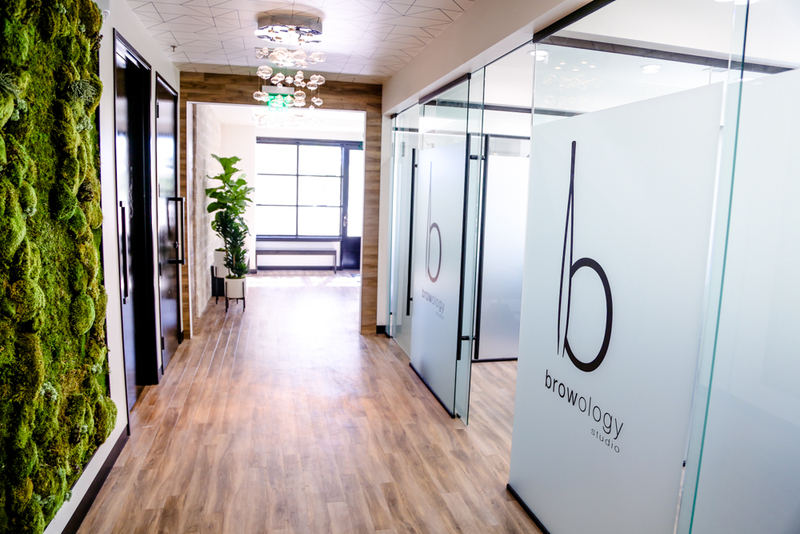 So what sets Browology apart from other brow studios? Genuine customer service. They care and it shows in every possible area. Once you walk in, you’re guaranteed to get a personable experience. Guests have said that they don’t want to leave and I can see why! The decor… the atmosphere… the warmth of the staff. Exceptional. When Stephanie did my eyebrows it didn’t feel like I was just a 12:50 p.m. appointment. It felt like I was hanging out with one of my friends chatting about Sons of Anarchy, local restaurants and just life in general. With stellar service and the ever so spectacular Stephanie at the helm, Browology just can’t be beat. This is a Social Sizzle article by Jasmín Nelson originally posted here.